Orlean Beeson School of Education and Samford’s Career Development Center co-hosted the annual teacher education interview day March 16 to help connect seniors in the teacher education program with potential employers. The event provided the opportunity for the interns to meet several school representatives and administrators. 52 interns participated and 32 recruiters from 21 schools or school districts were represented. The teacher candidates were given the opportunity to sign up with administrators and representatives for one-on-one interviews as well as visit other school representatives who were set up career fair style. More than 200 interviews were conducted. Recruiters representing private, public and non-profit schools located in Alabama, Florida and Georgia attended the event. Additionally, both the International Schools Consortium and Network of International Christian Schools were present. “It is an honor for recruiters from different school systems and non-profit agencies to come to Samford to interview our teacher education interns. I think it speaks to the volume of the readiness of our graduates," said Johnson. "This event has proven to be worthwhile for all those involved." 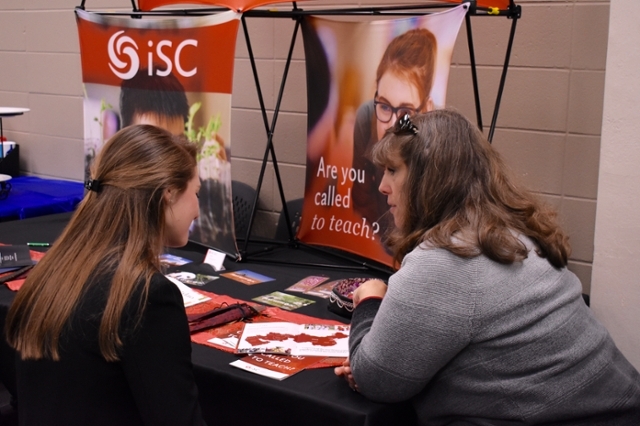 According Brent Latta, career and job search counselor in the Career Development Center, the event provides a tangible difference for both the teacher education interns and the school systems as it provides opportunities for them to meet at a convenient time and setting. "The representatives from the schools and school systems get maximum exposure to the talent available within our senior class of interns," said Latta. "On the other hand, our interns receive exposure with recruiters and principals and benefit from experiencing real interview preparation." "Anytime we can directly connect students with potential employers, we view it as an absolute positive," said Latta.